My goodness, y’all. This dinner. I made it in the middle of a thunderstorm after cleaning up unholy amounts of gag-inducing dog mucus, a pee puddle, and a lone hardened turd. * (Related: I will be SO HAPPY when Luna Bug is healthy and can come to work with us!) As I was chopping cabbage, I kept noticing a hint of rotting fruit scent. A short investigation of the nearby fruit bowl revealed a grapefruit that looked whole and healthy from the top, but was green and fuzzy underneath. Delightful. …my household hygiene issues aside, this meal itself caused me very little heartache. Aside from a decent amount of chopping, it’s a one-pot dish that’s pretty simple to prepare. 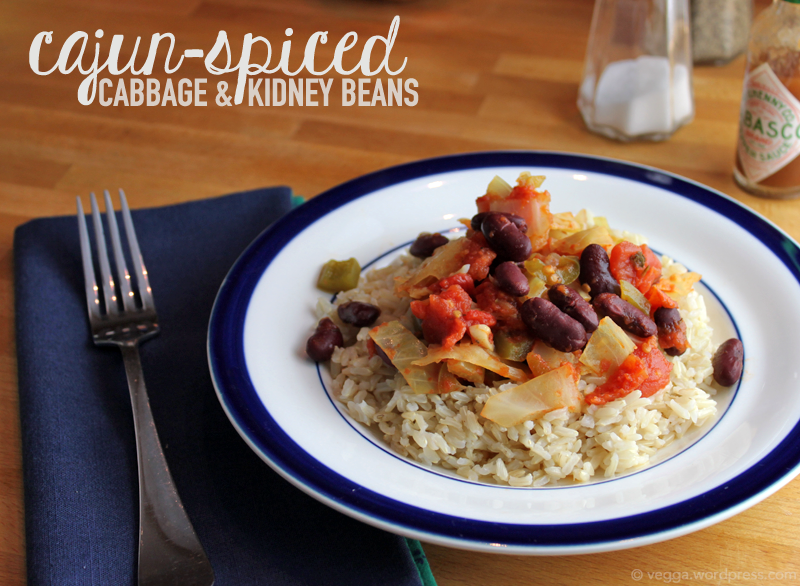 Cabbage, bell peppers, tomatoes, and kidney beans join forces with a healthy dose of Cajun-inspired spices for a fresh-tasting dish with a kick. And guess what? It’s damn healthy. Each of the five servings offers up about 10 grams of protein, 23% of the recommended daily value of iron, and lots of fiber, potassium, and vitamin C. Not bad for a bunch of veggies and a can of beans! And if you serve it over brown rice, like we did, you can add a few more grams of protein and fiber to your totals. Cooked brown rice or your grain of choice to serve. In a large saucepan, heat the olive oil and add minced garlic. Let simmer for about a minute, then add the celery and green bell pepper. Cook until they start to soften, about 5 minutes. 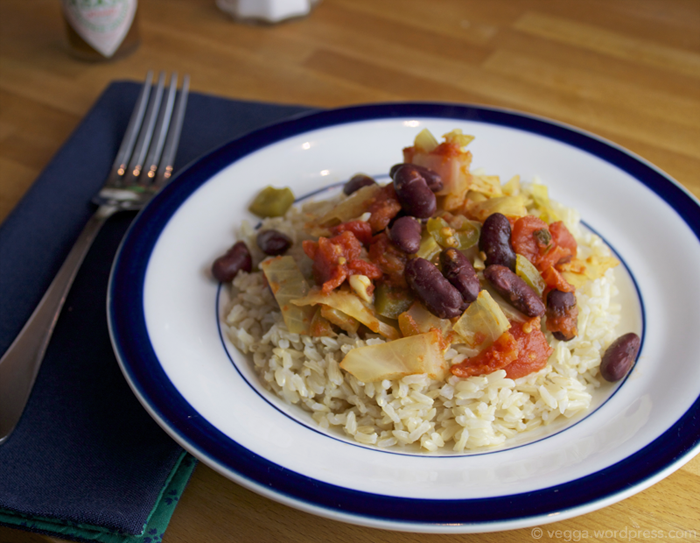 Add the cabbage, diced tomato, tomato puree, and spices. Bring to a low boil then turn down the heat. Cover and cook until the cabbage is softened, about 15-20 minutes. Mix in the kidney beans and add salt and pepper to taste. Serve over a bed of brown rice or your favorite grain. She may not be the most beautiful dish, but she sure is tasty. And healthy! What’s your favorite spice blend or flavor profile? * S helped. In fact, he did most of the cleaning. Thanks, darlin’. Thanks for stopping by! It was a surprise hit for sure.